Identification: Light brown. Forewing has 2 yellow-rimmed black eyespots both above and below. 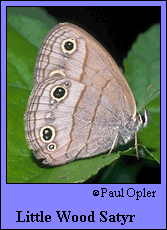 Hindwing has 2 eyespots on upper side; but may have smaller spots below. Life history: In the early morning and late afternoon, Little Wood Satyrs bask with their wings open while perched on tree leaves or on leaf litter. Adults have a slow bouncing flight and will rise as far as the tops of tall trees. Males patrol in the shade to find females. Eggs are laid singly on grass blades. Fourth-stage caterpillars hibernate. Flight: One brood from June-July in the north; two to three broods from March-September in the south. Caterpillar hosts: Orchard grass (Dactylis glomerata) and centipede grass (Eremochloa ophiuroides). Adult food: Sap, aphid honeydew, and rarely flower nectar. Habitat: Grassy woods and openings, old fields; especially in limey or basic soils. Range: Eastern Nebraska and northeastern Colorado south to eastern Texas; east through all of the eastern United States except northern New England, southern peninsular Florida, and coastal Louisiana.